Translation: The Lord then blessed all the Pracetas, saying: My dear princes, by My mercy, you can enjoy all the facilities of this world as well as the heavenly world. Indeed, you can enjoy all of them without hindrance and with full strength for one million celestial years. The Pracetas were very pious souls who were naturally inclined towards religiousness. They were full of knowledge and they were respecting their elders and were obedient servants of their father. They had instructed them to perform austerity and to worship the Supreme Personality of Godhead so that they prepare them for a suitable marriage and might then have suitable off springs. So we can see that their father was instructing them to approach the Supreme Lord for a mundane purpose, for a material purpose- a pious purpose nonetheless- but not fully transcendental. The attitude of the Pracetas was such that they had all good qualification. So Lord Siva being a great devotee of the Supreme Lord, being always absorbed in remembering the Supreme Lord in deep meditation, could see that these Pracetas were qualified recipients to receive the mercy of pure devotional service. Therefore he instructed them accordingly and gave them prayers based on just devotional service. So the Pracetas stand there as an emblem of purity and punya. The Caitanya Caritamrta describes to us that there are different kinds of piety. It is said there is karma- unmukhi sukrti, moksha unmukhi sukrti and bhakty-unmukhi sukrti or piety that is the result from engaging in karmic activities in the mode of goodness, then pious activities which are aiming at liberation. But then there is the benefit of devotional service which stands as eternal and that is truly our topic. It is there where the Pracetas became a subject matter and became worthy of being mentioned in the Srimad Bhagavatam. 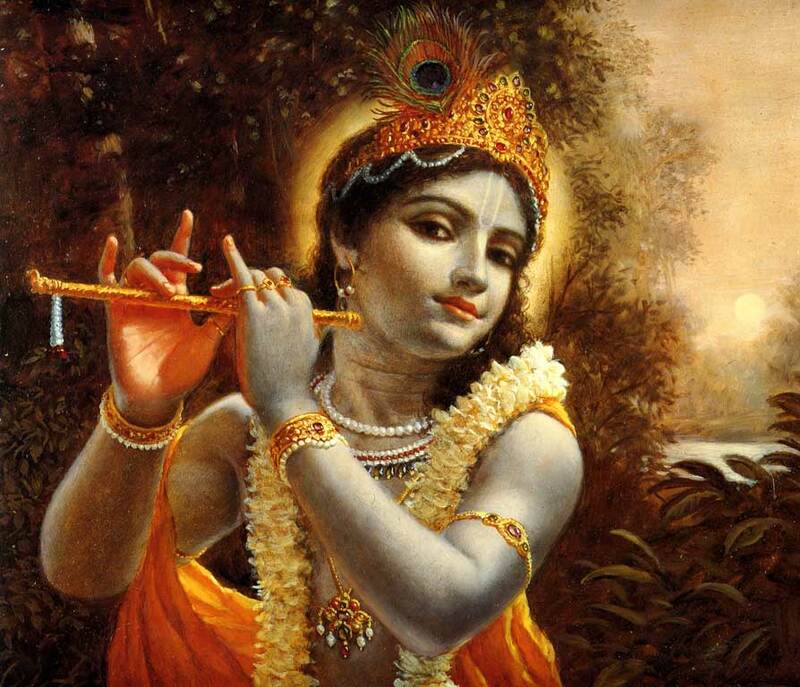 The Srimad Bhagavatam is dedicated to that point – the worship of the Supreme Personality of Godhead, Sri Krsna. So the Srimad Bhagavatam is establishing Lord Krsna as the Supreme Personality of Godhead and devotional service sa vai pumsam paro dharmo (Bhag.1.2.6) as the supreme activity which can completely satisfy the self. Then, as Srila Prabhupada pointed out, material assets in itself have no value in comparison to devotional service. They are zero but if you put one in front then all these zeroes become meaningful. So piety in itself, mundane piety in itself has no value but when a pious person engages in the service of Krsna then that becomes a great wealth and great opulence because that piety will be a great support in spiritual life. What to do for most of us? It is the age of Kali. It’s the ocean of faults and that ocean of faults is within our hearts. It is stated that within the heart, the heart is filled with aprarabhda karma or karma that is now not manifesting but the seeds of many sinful activities are stored within the heart. So the heart is the storehouse of sinful reactions and the result is a sinful inclination. Then the result is more sinful activities which increase the sinful stock and which increases the sinful inclination even more which leads to more sinful activities and which adds on to this stock and creates the intensity of our sinfulness! Therefore one could say that in this age of Kali we are thoroughly sinful. And what can we say? The sinfulness in our hearts may be buried in so many places. There are remnants of our previous sinful activities that may be there or as they say, in colloquial American, ‘everyone has skeletons in the closet.’ So that’s there! What to do? Srila Bhaktisiddhanta Sarasvati Thakura had an interesting angle on the word Krsna and he said that he used the word ‘akarshan’ as, Krsna being the one who can be attracted by devotional service. So both definitions are there. Krsna is attracting us and Krsna can be attracted by devotional service. That is our saving grace. It is now quite some years back when the deities of the Panca Tattva came down this Bhaktisiddhanta Road on the carts and were brought in into the property and were installed in this temporary temple. And I remember at that time different leaders were interviewed as to what their expectance was and the expectance was obviously ‘now things are going to change and something is going to happen.’ So it is unfolding right under our eyes, right here. We see that the temple is coming up, it is moving along and it must be because the Lord cannot remain in this temporary structure. That’s all it is. It looks like a nice hall and it’s just a temporary structure. This one is a little more fancy but also temporary. So the temple must be made because when the Lord is there He must be provided with a suitable environment. Worshipping the deity means making arrangements for the Lord where He can be situated with all the paraphernalia that are befitting to Him. So the temple must be there. The other day I was reading some quotes of Srila Bhaktisiddhanta Sarasvati Thakura and they are still fresh in my mind, so they are coming out on this day. He was describing how one of his disciples had spent his life savings to build this beautiful temple in Calcutta. Then Srila Bhaktisiddhanta was continuing and was saying that, this temple that is made of cement and bricks is not the real temple. He said the real temple must be made in the heart. Then he said that in order to achieve that many books will have to be written. So Prabhupada did that. Many books were written and now and then of course, the next thing also is to distribute because this knowledge of the Bhagavata, this knowledge of Bhagavan, this must be spread all over the world- how to serve the Supreme Lord. all beauty, all wealth, all knowledge etc. But Srila Jiva Goswami gives another translation of the word Bhagavan. I also want to share that with you. He says we can break up the word Bhagavan in three syllables – Ba, ga and va- and he says the meaning of the word Bhagavan is bhajaniya guna vasista. And bhajaniya guna vasista is very nice because it means that Lord, who is irresistible that you have to worship Him. And everything rests on that. Simply in this ocean of faults the holy name is penetrating. abhinnatvan nama naminoh, says Padma Purana, and it is non- different from Krsna. bhajaniya guna vasista you have to, you have to! When that holy name penetrates and some people cover their ears, they don’t want to hear, they stuff their ears and we chant louder and somehow or other it penetrates! I didn’t want to hear the holy name. I saw the devotees and they looked like the emblem of religious fanaticism. I had never seen anything like it. (Imitates devotees) ‘Hare Krsna Hare Krsna, Krsna Krsna Hare Hare, Hare Rama Hare Rama, Rama Rama Hare Hare.’ The brahmacaris thought they were fired up. To me it looked like total extremism! So I stayed clear from the Hare Krsnas!. Then got a girl friend who had a dog named Krsna. (laughter) The holy name penetrates and I was out at night and the dog wouldn’t come back. So I was calling out, ‘Krsnaaaaaaaa!’ Every night around the block starting a harinam! (Laughter) Lord Caitanya is just everywhere, entering into our lives, making arrangements for His pure devotee and Srila Prabhupada arrived. It wasn’t easy but the time was right. People were looking and they wanted something. Okay their heads were in the clouds, literally. They were way out there and (sings) ‘one, two, three, four, what are we fighting for? Not going to Vietnam’ and all that. And Prabhupada said, ‘Arjuna had to fight!’ So he did not compromise and gave the pure truth. In his trunk he had brought Srimad Bhagavatam that he had printed in India. That was his mission. Prabhupada once said that Srimad Bhagavatam should be placed in every home on the planet. This temple of the Vedic Planetarium it is not a planetarium but it is the 5th Canto! It’s the Bhagavatam! It is not about the planetarium, its about the Bhagavatam. It is the temple which makes the Bhagavatam. So Srila Bhaktisiddhanta was saying that not only a temple of bricks and cement but a temple in the heart and a temple of books. Then then it will be done. So the temple of books is here and also spreading everywhere in the world by book distribution. I was thinking yesterday evening, as I was sitting there in the kirtana and it was so transcendental…I was first and what can I say, I started a raga and it transforms into rock! That’s due to the sixties and seventies. What to do? 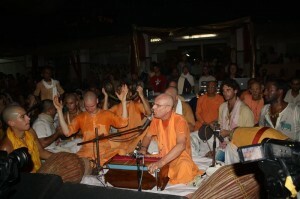 But then Sacinandana Maharaja began in his prayerful and enthusiastic way and he is the inspiration of this kirtan mela. And I was looking at the Panca Tattva and at Their amazing effulgence and that very extraordinary beautiful golden darshan and I was thinking, it’s all Gauranga! It’s all His plan! He just inspired Sacinandana Swami, who is deep. He has the strength and he is into going into depth in spiritual life. He is into deep bhajan, into deep worship. 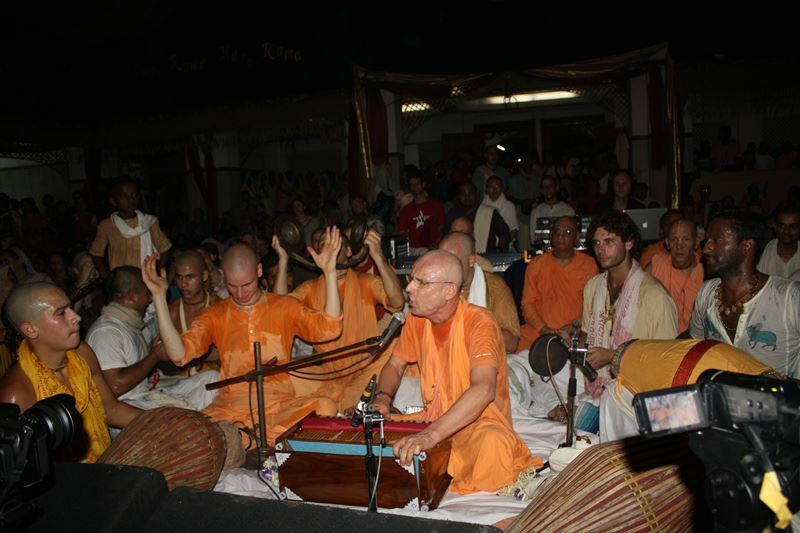 He is the one who gave us japa retreats, Govardhana retreats, gave us Kirtan mela and who says to us, ‘My dear devotees, I will tell you something very important.’ (Laughter) And basically he means to say is, ‘quality.’ If you burn it down to one word then it is ‘quality’ – quality chanting and quality contemplation. Not just automatic pilot, not just be there and go along with the flow. No! Work for it, work hard, try to get the mercy of the holy name, go in, chant, concentrate, fix the mind and so forth! That’s what he is preaching all the time in different ways and that’s what is needed. In the purport to that verse Prabhupada is saying that in this age of Kali no one is interested in going to temple, no one is interested in going to the mosque or to the church. But when there is wide chanting of the holy name of Krsna everywhere then people get attracted. bhajaniya guna vasista, He is irresistible. We had so many festivals but the Kirtan mela has become an element of the festival that will never leave, I guarantee it! It cannot leave anymore because we are already terribly attached to it. We already want it again! I am already thinking well that I guess I am coming next year and probably the year after that also. And that attachment will grow and it will grow bigger and it will be in that big temple and the power will grow, the absorption will grow and we don’t know what we will see, what will happen. When we sometimes read the stories of the Bhakti-ratnakara, we see how in the kirtans of Narottama dasa Thakura that suddenly the Panca Tattva appear! They are there, they are dancing with the devotees and everyone is swept up in ecstasy. 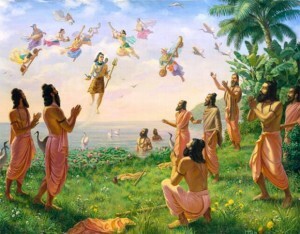 Then they disappeared and all the devotees cried rivers of tears! So much that the ground became muddy! What to say! Miracles! Miracles happened and miracles will happen. Miracles happened, miracles are happening and more miracles to come. Make sure you are around to be part of the fun. Don’t miss out! So in this way it is a wonderful time. ‘Oh its Kali yuga!’ that’s going to be the last thing I say because time is running out. It’s Kali yuga, an ocean of faults. Sometimes devotees come together and we have some ‘Kali yuga katha.’ Like, ‘oh you know, it’s really bad out there! Oh yeah! So bad! The things that they are eating, the things that they are doing…’ and we get into Kali yuga. Once I was in Karoli where the deity of Madana Mohan is and I said the same thing to the pujari. I said, ‘You are in such a nice place. You don’t know what it’s like out there in Kali yuga.’ He said, ‘Ya, Kali yuga- there are a thousand Kali yugas in a day of Brahma. They come and go very quick.’ (Laughter) He wasn’t impressed by Kali yuga but we are because we are affected by Kali yuga. We feel the burden of Kali yuga within our hearts. One devotee told me, ‘I stopped chanting. I just have no taste, no taste!’ Yeah well that’s ok. The first reason why we are chanting is for purification. If we cannot chant with taste then let us chant out of fear, fear of hell. I am sorry to say but let’s chant out of fear of hell and lets look for some purification. There is a hell in the fifth canto. The telephone rang in the temple and I never pick it up because I am a visitor. It was at ten ‘o clock at night and I just somehow or other I picked it up. This lady goes, ‘It’s not true! It’s not true! That all my family is going to hell.’ Okay! I said, ‘Calm down lady! Calm down! Start at the beginning, not at the end.’ (Laughter) Someone had given her the book, ‘A second chance.’ (Laughter and applause) and she read it, as you can understand. It’s kind of a heavy book. So chant. If you have no taste then chant for purification. That’s the first thing. agham dhunvanti kartsnyena niharam iva bhaskarah (Bhag. 6.1.15) It roots out the sins from the heart, from the very root for good. So that is good. Then we become attracted with time and more and more attracted and finally: Krsna kirtana gana nartana parau premamrtambho nidhi (Sad Gosvami Astakam, Verse 1) Eventually we will experience that this chanting is like an ocean of transcendental love. In the Caitanya Caritamrta, Adi lila, chapter 4 the loving qualities of Srimati Radharani are described. It is said that Her love is embracing the qualities of Krsna and He has unlimited qualities. Each time She discovers a new quality of Krsna and then Her love immediately embraces that quality also. And then She finds another one and She embraces that also! And another one and She embraces that also! And all the devotees are also like that. We all discover more about Krsna and we embrace it also. We have already started and it will go on forever. 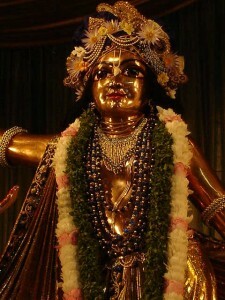 And Krsna, when He sees all that love in the heart of His devotees, His heart melts and His love increases! In this way there is an ocean of ever-increasing love of all the devotees and Krsna’s love combined and it’s just going on and on. And this is premamrtambo, the ocean of transcendental love. Through this chanting we are going to enter there! So don’t stay outside and say, ‘I don’t know, I stopped chanting, I have no taste, you know.’ Don’t be sour. Chant! Chant! Chant! Why? In the Laghu Bhagavatamrta it is said in other Kali yugas there is also harinama sankirtana, there’s also an incarnation of the Lord- a blackish form of Lord Visnu who preaches harinama sankirtana. What’s the difference between those Kali yugas and this one? Those incarnations of the Lord, cannot give the same mercy as Lord Caitanya and therefore now in this age, there are very quick results. You start off saying, ‘oh it’s so tough, this chanting,’ and before you know it is actually very nice and before you know its actually, ‘I can’t stop chanting!’ and so on. It is like that. Therefore, Kali yuga is the ocean of faults. Srila Visvanatha Cakravarti Thakura says that when you have a jewel if you want to see the jewel you put it on a black background because then it looks even better. Actually that amazing mercy of Lord Caitanya, that amazing chanting of holy name, this amazing miracle that is happening to us is on the blackest of the blackest of the blackest of the blackest background of Kali yuga. In our black hearts there is this light of the holy name and everything will change. 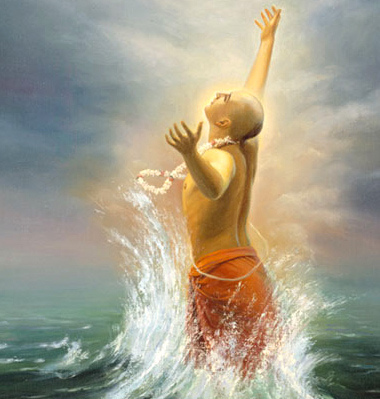 Prabhupada has prayed that where we fall short that we will be accepted anyway. So don’t worry, even if the performance is not great, Prabhupada’s prayer is there. So in this way everything will be auspicious and good- all good! Thank you very much. Srila Prabhupada ki jaya! If there is one question or comment it is welcome. Devotee: Thank you Maharaja. So what is the difference between Sacinandana Maharaja (inaudible) to work hard and as the Christians say ‘not by works’? Maharaja: You know, the Christians have to work hard. But that’s not all. If it was only hard work for the Christians where would they go? No, they also have the mercy of Jesus and that’s no joke! No joke! But look at what we have- we have the eternal process! The Christians have prayer, which brings them closer to the Lord. We are already with the Lord, we are already with Him from day one! The Adi Purana says that by chanting the holy name one is associating with the Lord. We are already there. You know the joke of the Pope who came to Vrindavana met the devotees and had a phone. And the vasinava says to him, ‘Who are you speaking to? Then later the devotee pulls out his phone and he also makes a call. (Pope): ‘What’s that you also have a phone like that? So what to say? But the Christians were preparing the ground for Lord Caitanya’s movement. That was what they were doing. They brought everyone closer and were ready preparing. Jesus Christ even took the name ‘Christa.’ This is a name of Krsna. But preparing the ground, that is all. By chanting the holy name we are in the spiritual world. In the beginning we’re still sort of dazed and half sleeping and that’s why Sacinandana Swami will always say, ‘don’t sleep!’ He’ll say all the time because we are in the spiritual world but we are sleeping. The chanting is awakening us. By just hearing and chanting: by chanting Hare Krsna and discussing Srimad Bhagavatam then our natural love for Krsna will awaken. It’s already there. We are sleeping, it will just re-emerge. So therefore all good Christians also will become devotees. I was once in a university and it was a Christian university and students were all hard-core Christians. I gave a lecture and they gave me a New Testament after that and the Professor was a Budhhist. So the Professor was suffering a lot, that’s what Buddhists do. (laughter) and the students were asking a question: ‘what about Jesus being the only way?’ I said, yes, yes, yes! He is the only way! That’s not the issue. That’s not what the discussion is. The only issue is that who are the Christians? As far as I can see the only real Christians in the full sense of the term are the Hare Krsnas. Hare Krsna! Thank you so much! Srila Prabhupada ki jaya!